Tube by Bonnie's Creations. Get it HERE. 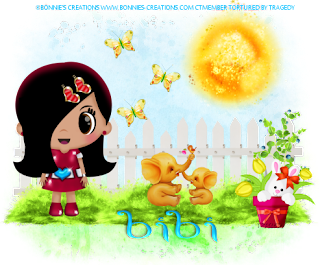 Happy kit by Bibi's Collection. Get it at SATC. Apply mask of choice & Merge group. Position to one side of the bottom of the fence. Duplicate Grass again and position in the middle. Position over the far right of the fence. Position over the left side of the fence. Position near the center of the grass. Position over the bottom of the blueberry branch. Position butterflies over the "Sky"